A week ago I fought a Modern Spearhead against Keith. Our armies are old foes now... my BAOR and Keith's Soviets, the battles set in a cold war gone hot situation set in 1982. Often we will write up the battles, add a little fictional banter for colour and fun, and enjoy the spectacle. Our battle of a week ago had amore profound effect, and I decided to write this up in a different way to highlight what I believe is the great strength of this games system. Keith's scenario generation system generated a meeting engagement, with each of us using defend lists. My own list composition is important to the discussion. I had taken an armoured regiment, and two mechanised infantry battalions, the armour and infantry cross attached to create three combined arms battalions. The force had two regiments of larger heavy artillery for counter battery fire, and a battalion of Abbots in support, There was also an air presence with a Harrier flight and FAC, and a Lynx flight. (the Lynx flight the result of me taking an Option A as an addition to my list, producing a 1 point VP penalty. Th defend lists mean that troop densities are much lower for both sides. The first photo shows the battlefield, BAOR advancing from the left, Soviets from the right. I decided to advance two battalions into two of the objectives behind the river, and then to adopt a defensive poster in the hope that I could score additional VPs by inflicting morale checks on Soviet battalions. My third manoeuvre battalion was held in reserve, its entry point to be on my right flank. I was expecting the Soviets to attempt to take the right objective s(my right flank, that is) and then attempt to sweep onto my flank. I wanted to catch them in their own flank as they swept around. My usual 'modus operandi' is to use radar location to locate opposing AA assets, use my long range artillery to neutralise the enemy air umbrella, and then call in my own air strikes to attack opposing ground assets. Alternatively (or additionally) I use my heavy artillery to target enemy artillery assets. Keith seemed to have taken the bait, advancing against the unoccupied objectives. He admitted that he expected the main battle to occur there, and was surprised that I hadn't attempted to take those objectives myself. Keith 'wrong footed' me on several levels. First he took long range SAM 2 for AA cover (in addition to on table non radar controlled AA), and so my M107 and M109 heavy artillery was outranged. I was unable to neutralise his AA umbrella. Secondly he deployed two flights of HIND 24 attack helicopters. This exploits what in my opinion is the biggest weakness of BAOR forces, lack of adequate AA cover of their own. I had off table Rapier, and on table blowpipe. Keith located my Rapier battery and neutralised it with his own heavy howitzers. The Blowpipe were ineffective against his helicopters. He then pushed a motorised infantry battalion across the river and attacked my own right flank. The Hinds successfully took out the Chieftain tank support of my right flank battalion. My own Lynx flight appeared on table the turn after the Hinds (we had each used waypoints to bring on our helicopter support. In the absence of targets my Lynx was allowed to move off its waypoint to attack further Soviet armour, bringing it into range of the Hinds. We hadn't realised until this game that in this case the enemy helicopters became a target priority for the Hinds, so shifting my Lynx across to attack additional enemy armour actually protected the ground battalion from additional air attacks. I committed my reserve battalion, but it was too late. My right flank failed its morale check and withdrew from the field. Keith's most profound success (amongst many BTW) was to take away from me what I'd thought was the underlying 'grand tactical' approach of playing a combined arms game. Essentially his approach deprived me of the ability to play the divisional/corps level (of table) game (ECW/CB etc). He refused to 'come out and play'. Brilliant!!! My biggest failing (amongst many) was to become so focussed on that aspect of game play with the Brits that I had actually ceased to play a combined arms game at all. Keith on the other hand did, and the outcome was arguably never in doubt. It continues to be true that in order to win with the BAOR you have to use ALL components of the forces available, and this I failed to do. That said, I also failed to create a convincing plan at the tactical level either (another significant failing). Get back to basics, recognise that ECW action in order to deploy air support is important but not to become fixated on it. None of that answers the British AA vulnerability but that said, that cannot be used as an excuse. You have to play your own game. This is really exciting - NO other games system has me thinking in this way. While not well read on the campaign I have for quite a while had plans to fight battles from the France 1940 campaign in both 6mm and 20mm. A while ago I received one of several very generous gifts from Gerard Davey, one of which included British infantry (Welsh Guards as it turns out) in 20mm specifically for this period. They have languished in their box awaiting the Spearhead treatment - basing and labelling. There were sufficient figures to give me an almost complete infantry brigade of the strength that I'd field in a typical infantry division list for Keith's Scenario Generation System (just a few FAOs short). Finally, the finished product - four infantry battalions with some of their heavy support. 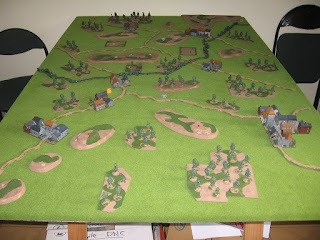 I can game this campaign in both 6mm and 20mm. Now... all I have to do is get some game time in.